Jay Z took to the stage last night along with Madonna, Rihanna, Alicia Keys and his boo Beyonce to launch his music streaming service Tidal's new premium tier. It costs £9.99 a month (compared to the HiFi tier, which is £19.99 a month and was available previously). You can access it through the Tidal.com website, or download the app for iOS or Android. It's also available on Sonos. Tidal's aim is to help artists make more money, and is a reaction to the free streaming model used by Spotify and the like. The artists get double the usual royalties on the HiFi tier, but no more than any other streaming service on the premium tier. That's enough about the artists. How does it stack up for us punters? Here's a quick comparison. Both Tidal streaming plans also give you extras like music videos and curated editorial. 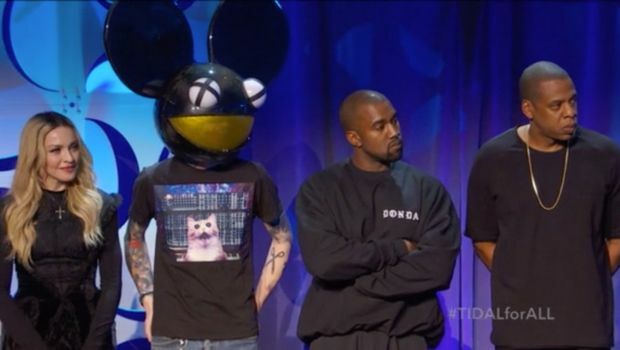 Tidal was originally launched by Norwegian company Aspiro in October 2014. Jay Z picked it up for $56 million earlier this year. In a recent interview with Billboard, he said: "We didn't like the direction music was going and thought maybe we could get in and strike an honest blow. Will artists make more money? Even if it means less profit for our bottom line, absolutely. That's easy for us. We can do that. Less profit for our bottom line, more money for the artist; absolutely." Things are hotting up in the music streaming space. Last year, Taylor Swift pulled all her music from Spotify, claiming it didn't pay well enough. Others have also been disgruntled at the free model. It's all well and good putting the artists first, but are people willing to pay for music once they've had it for free? Jay Z better hope so, or it could be one of his 99 problems.